Chicken is my all time favorite. Be it fried, sauced or steamed, chicken will always be part of my weekly meal. 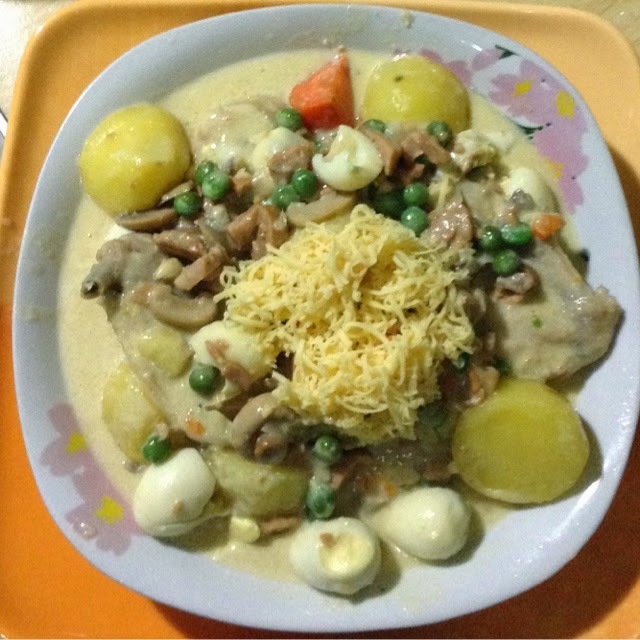 When I got the hang of cooking, Chicken Pastel was one of the chicken recipes I made sure I learned how to cook. Chicken Pastel can be an expensive recipe, but it's up to you to make your recipe fit your budget. I decided to use ingredients not as expensive but just as delicious as the pricey ones you will find at the grocery store. So now, I'm sharing my Chicken Pastel recipe with other mommas and I hope you have as much fun cooking it and I hope your kids like my 8 year old pamangkin Sofia enjoy eating it too! About 8 pcs medium potatoes (sliced into 2) - I fried them too! 4. Add laurel leaves, green peas and mushroom, simmer. Let me know how yours go fellow mommas'! Yeah I've always thought Chicken Pastel was an expensive dish so i kinda steered away from it. Thanks for sharing your recipe! Like May, I consider Chicken Pastel an expensive dish so I don't cook it a home. hehehe! I love love love creamy Chicken Pastel!